HARLAN, Iowa – Mike Nichols started racing 20-some years ago with aspirations that didn’t go much further than simply winning a heat race. 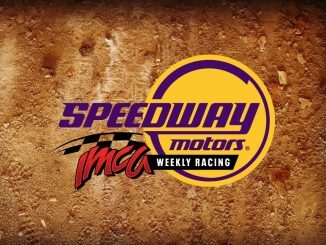 On Sunday, the overachiever raced to his career 500th IMCA Sunoco Stock Car feature victory during Dawson County Raceway’s Connie Jewett Memorial. The Aug. 26 win at the Lexington, Neb., oval was his 39th of the season and came in a stellar field that included David Murray Jr., IMCA’s all-time single division leader with 550 career Modified checkers. Just the second driver in IMCA history to reach the 500 win mark, Nichols used a word of his own making – ironical – to describe having to pass Murray to accomplish the feat. His IMCA-best total of 34 track championships already includes eight Dawson County titles in the last nine years. Chasing a record-extending eighth national championship, Nichols won features at 11 tracks in four states, including 13 victories in racing to another perfect season at Lexington. How much longer he’ll be racing and having fun remain to be determined. Nichols turns 41 in early September and is juggling work, college and building a new home as well as racing. By Kelly Ninas LEXINGTON, Neb. 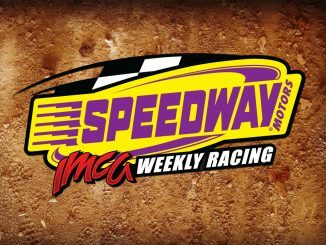 (Aug. 5) – Grabbing an early lead and never looking back, Anthony Roth scored another IMCA Modified feature victory Sunday at Dawson County Raceway. Roth had started from the inside of the third row. Working the bugs out of a new ride, David Murray Jr. found the groove that worked best during the second half of the feature event to earn a podium finish in second place overall. Recovering from an early incident, Chuck Stryker was third. 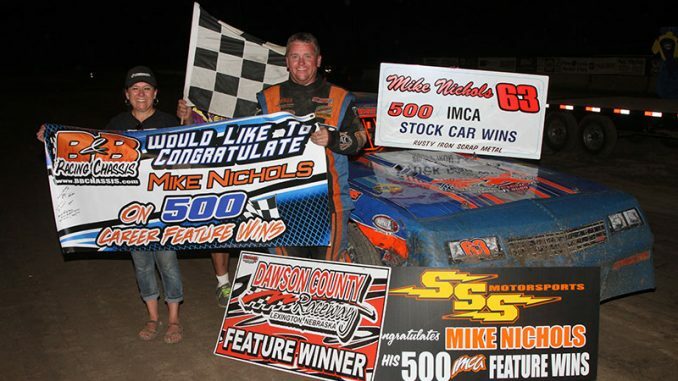 Knocking on the door of 500 career wins in the class, Mike Nichols paced the IMCA Sunoco Stock Car main while Luke Wassom’s fast start ultimately put him in victory lane at the conclusion of the IMCA Sunoco Hobby Stock feature. Working his magic during the final laps, Jacob Olmstead drove to the winner’s circle after winning the Karl Chevrolet Northern SportMod headliner. By Kelly Ninas LEXINGTON, Neb. (May 27) – Anthony Roth, Tony Schultz, Mike Nichols and Zach Olmstead earned trips to the winner’s circle on Sunday evening at Dawson County Raceway. Wasting no time to get to the front, Roth got the lead on the second lap and never looked back to capture his third straight IMCA Modified victory at Lexington. Veteran wheelman Schultz regained the lead following a lap 11 restart in winning the Karl Chevrolet Northern SportMod main. 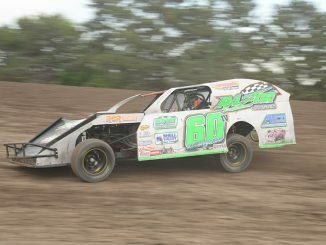 No stranger to victory lane, Nichols won his third straight IMCA Sunoco Stock Car feature from the ninth starting spot. The battle for the lead was heavy and heated in the IMCA Sunoco Hobby Stock feature with Olmstead leading the final eight laps to claim the victory.